The stomach model shows the different and individual layers of the stomach wall. 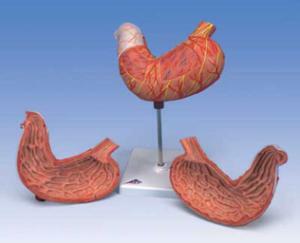 The front half of the stomach is removable for detailed study of the anatomy of the human stomach. The replica of the stomach depicts: Lower esophagus, Vessels and Nerves. Stomach delivered on stand.